The optical components of Schneider’s megapixel, enlarging lenses are inserted into a compact and robust diaphragm body, which makes it possible to adjust and to lock the aperture and to use accessories such as filters. Because the interface is identical on both sides, the lenses can be reversed for magnifying images. Designed for use with line scan cameras up to 8K pixels and with most area array sensors, these lenses provide maximum application flexibility. Extra-large image circle up to 141mm and with very low distortion, these lenses provide excellent imagery. When combined with our wide assortment of focus mounts, these lenses cover magnifications ranging from 0.5X to 30X, with some working well out to infinity. 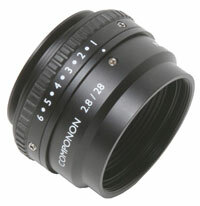 A lens system is composed of a focus mount, extension tubes, and adapters for your specific requirements.